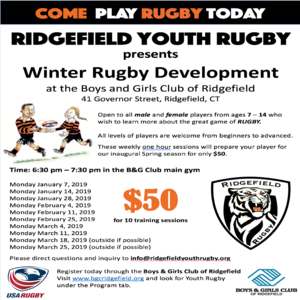 Register today for our 2019 Rugby Winter Development sessions at http://www.bgcridgefield.org/ under Programs - Rugby. All sessions will be held at the Ridgefield Boys & Girls Club gym on most Monday nights from 6:30 pm - 7:30 pm throughout January, February and March. These weekly one hour sessions will prepare your player for our inaugural Spring Rugby season.